It appears that Kia just can’t stop updating the Sorento. After switching to a unibody structure for the 2010 model year, Kia gave it a major refresh for 2014, adding a new V6 engine, a new platform, and 80 percent new or re-engineered parts. Now Kia gives us yet another new Sorento. A redesigned Sorento arrives as an early 2016 model, and it reflects all the work Kia has put into its midsize crossover over the past half-decade. The 2016 Kia Sorento is three inches longer than the previous models, placing it squarely in the midsize class, while the last model could be viewed as compact. The increased size adds useful interior space, especially for front- and rear-seat passengers. As in the past, a third-row seat is available, upping seating capacity from five to seven. The third row is best used in emergencies or for children. The Sorento simply isn’t big enough for third-row passengers to be comfortable for long hauls. Front-seat occupants will be comfortable, though, and they will find the interior environment to be attractive and upscale, even in the base model. The top-end model features luxury amenities such as soft Nappa upholstery, a panoramic sunroof, heated and ventilated seats, a heated steering wheel, and a state-of-the-art infotainment system. That infotainment system, called UVO, is standard on all but the base model, and it offers such features as access to apps through owners’ smartphones, Siri Eyes Free voice control, geo-fencing and curfew alerts, and satellite services including real-time traffic, stock quotes, sports scores, and more. The Sorento isn’t ahead of the curve in terms of vehicle dynamics, but it is competitive. Greater use of high-strength steel improves torsional rigidity, which aids handling and reduces interior noise. The Sorento also offers some advanced features such as rack-mounted power steering and torque vectoring control for its all-wheel-drive system. On the road, handling is controlled, and the ride is smooth and quiet. The Sorento is quietest with its smooth and capable 3.3-liter V6. Kia adds a 2.0-liter turbocharged four-cylinder engine for 2016, and it has as much torque as the six, though not quite as much horsepower. Response when accelerating from a standstill is somewhat lacking, but the turbo four is quite capable at highway speeds. We think this new engine offers a fine balance of power and fuel economy, and it would likely be our choice. The base engine is a naturally aspirated four-cylinder that delivers fine fuel economy but little power. The 2016 Sorento ranges in price from just under $25,000 to the mid $40,000-range. With its three available engines it can serve as a budget-minded purchase for a small family or a fairly luxurious crossover for up to seven. We think the sweet spot is in the middle, around $32,000, for a 2016 Sorento EX with the turbocharged four-cylinder engine. At that price, the Sorento is an attractive and wise choice among midsize crossovers. The 2016 Kia Sorento is offered in five trim levels with three different engines. Trim levels consist of L, LX, EX, SX and SX Limited. The base 2.4-liter four-cylinder engine is standard in the L and LX. A new 2.0-liter turbocharged four-cylinder is offered in the EX and SX Limited. The carryover 3.3-liter V6 is available in the LX, EX, SX and SX Limited. All models have a 6-speed automatic transmission. 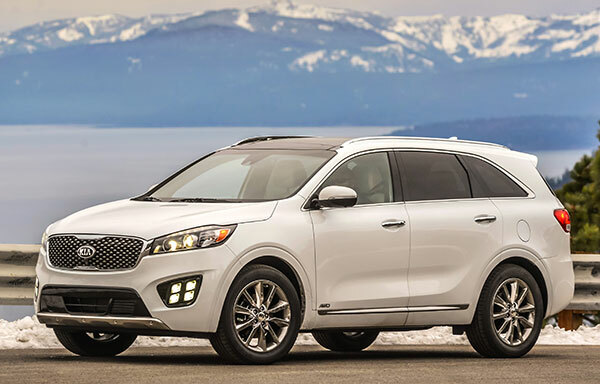 Front-wheel drive is standard, and all-wheel drive is optional on all but the Sorento L model. The Kia Sorento L ($24,900) comes standard with manual air conditioning, cruise control, power windows with one-touch auto up/down, power locks, power mirrors, remote keyless entry, AM/FM/CD stereo, satellite radio, auxiliary input jack, USB port, Bluetooth connectivity, tilt/telescoping steering wheel, trip computer, Yes Essentials fabric upholstery, 40/20/40 split-folding second-row seats, trip computer, Driver Mode Select, rear spoiler, and 17-inch alloy wheels. The Sorento LX ($26,200) and LX V6 ($28,700) add automatic headlights, roof rails, two additional USB ports, UVO audio system with UVO eServices and 8-inch touchscreen, and a rearview camera. The LX V6 also gets a 50/50 split-folding third-row seat. The Sorento EX 2.0 Turbo ($31,100) and EX V6 ($31,700) upgrade with dual-zone automatic climate control, leather-wrapped steering wheel and shift knob, auto-dimming rearview mirror, leather seat trim (first and second rows), eight-way power adjustable driver’s seat with lumbar support, heated front seats, and 18-inch alloy wheels. The Sorento SX ($37,900) adds power-folding side mirrors, 14-way power driver’s seat with 4-way lumbar support, memory for the driver’s seat and mirrors, panoramic sunroof, 110-volt power outlet, navigation system with real-time traffic, 10-speaker Infinity surround sound audio system, push-button start with Smart Key, 7-inch instrument cluster display, compass, power liftgate, second-row sunshades, Blind Spot Detection System, Rear Cross Traffic Alert, and 19-inch alloy wheels. The Sorento SX 2.0 Turbo Limited ($39,900) and SX V6 Limited ($41,300) get premium Nappa leather seat trim, heated steering wheel, heated and ventilated front seats, and heated outboard rear seats. Much of the equipment from the higher line models is optional for lower line models. In addition, Kia offers a Technology Package ($2500) that includes adaptive cruise control, Surround View Monitor, Lane Departure Warning, Forward Collision Warning, electronic parking brake, and HID headlights with auto leveling. All-wheel drive ($1800) and the third-row seat package ($1200) are also optional for almost all models. The 2016 Sorento gets a new look that Kia says was inspired by the Cross GT concept that debuted at the 2013 Chicago Auto Show. That concept vehicle was far more aggressive than the Sorento, and the new look is really just an evolution of the outgoing model. That’s not to say it’s not better looking because it is. The grille is larger and more pronounced, additional chrome trim is tastefully applied, and the overall look is more modern and stylish. Depending on the model, buyers get 17-, 18- or 19-inch wheels, and alloy wheels are standard on all models. LED fog lights are standard, and the taillights use LEDs, too. Roof rails come on all but the base model. The new Sorento is larger, too. The wheelbase is 3.1 inches longer and total length grows by three inches. The vehicle sits a half inch lower and the floor drops by two inches. The main benefit of the Sorento’s larger dimensions is increased interior space. Cargo capacity grows from 72.5 to 74 cubic feet in five-passenger versions with the second-row seats folded flat, and space behind the available third row increases from 9.1 to 11 cubic feet. That gives the Sorento as much or more space than the competition. Unlike most competitors, however, the Sorento offers an optional third-row seat. While the increased space gives first- and second-row occupants plenty of room, it does little for the third row. It’s best to think of the third row as emergency seating for kids. Yes, a pair of adults can fit back there, but they will be chewing on their knees with their heads stuck against the headlliner, and getting back there requires climbing over a second-row seat that doesn’t slide far enough forward. If you’re looking for a true 7-passenger crossover, it’s best to look at one of the larger crossovers such as the Dodge Durango, Chevrolet Traverse, or Toyota Highlander. You won’t want to look for an alternative when you see the quality of the Sorento’s cabin. The interior environment is decidedly upscale, with soft-touch surfaces on the dash, door panels, and armrests. Kia provides nice little touches like lighting around the USB port and metal-trimmed controls. The dash is a large black expanse without much design to it, but the shape of the grille is reflected in a surround that encompasses the dashboard touchscreen and a pair of vents. The touchscreen houses Kia’s UVO infotainment system. It features an 8-inch screen surrounded by several buttons that can be used to go to the various types of command trees, including navigation, phone, vehicle information, radio and other types of media. Owners can access apps on their smartphones through the system, including Yelp, Soundhound, Pandora, and iHeartRadio, and it serves as the home for Sirius XM satellite services that include real-time traffic, weather, sports scores, stock quotes, fuel prices, and movie times. But that’s not all. UVO offers eServices, which consist of geo-fencing, speed alerts, curfew alerts, and a driving score. Finally, it comes with Siri Eyes Free and Google local search. This allows drivers to search for addresses and points of interest using voice commands to their connected iPhones and the results pop up on the center screen. With all that technology, UVO is at the forefront of infotainment technology, and we found it works pretty well, too. The buttons along the perimeter make it easy to understand, and the system reacts quickly to inputs. Of course, all this information can be a distraction, so be sure to keep your eyes on the road. In addition to the center screen, higher end models also get a 7-inch screen in the instrument cluster to show trip computer, navigation directions, speed, radio station, and other types of information. We were annoyed that this screen also flashed a notice to tell us we had turned on or off the windshield wipers. Higher end models also offer several other features not expected in this class, such as a 14-way power adjustable driver’s seat, heated and ventilated front seats, a heated steering wheel, and a 630-watt Infinity audio system with Clari-Fi technology. Clari-Fi uses an algorithm to rebuild audio details lost in digitally compressed music. In our limited exposure, it sounds quite good. The big news for 2016 is the addition of a 2.0-liter turbocharged four-cylinder engine to fit between the naturally aspirated (non-turbo) four-cylinder and the V6. It has less horsepower but more torque than the V6, and it is excellent on the highway, delivering ready passing punch. From a stop, however, we found that the turbo four was slow to react to throttle application, likely due more to the otherwise smooth-shifting 6-speed automatic transmission than turbo lag. Other than that minor issue, the turbo four is mostly a match for the V6, though it’s not quite as smooth. The price difference between the turbo four and the V6 is as little as $600, so buyers will have to decide if the V6’s slightly more willing and smoother power is worth the money and two miles per gallon overall. Fuel economy for the 2.4-liter engine that comes on Sorento L and Sorento LX models is an EPA-rated 21/29 mpg City/Highway. The new 2.0-liter turbocharged engine offered on Sorento EX and Sorento SX Limited models is rated 20/27 mpg. The 3.3-liter V6 available on Sorento LX, EX, SX and SX Limited is rated 18/26 mpg. One of the reasons the base engine isn’t wise choice is the fact that the Sorento is bigger this year. It grows three inches in length and is slightly wider. The new structure uses 115 percent more high- and ultra-high-strength steel, increasing rigidity by 14 percent. The suspension also gets front and rear H-shaped subframes, and longer control arms. The result is a smooth-riding, well-controlled crossover. That isn’t to say that the Sorento is sporty, but it’s as pleasant to drive as just about any rival. Kia has traditionally struggled with suspension tuning, but the Sorento’s dynamics are now right in line with the class. All models have electric power steering, but only Sorento SX models get a rack-mounted system, which is the most expensive and provides the most road feel. Few drivers will notice the difference, and we found the steering had a natural feel in any model. A Drive Mode Select button has a Sport mode that adds a bit of heft to the steering (it also holds gears longer) that we prefer, but otherwise the steering is typical of a family crossover: a bit slow but direct. The Kia Sorento keeps getting better. Larger for 2016, it has more interior space for the first and second rows, though the available third row is still just for kids. The interior environment is upscale, and it offers lots of amenities, including a state-of-the-art infotainment system. A new turbocharged four-cylinder engine offers a fine balance of power and fuel economy, making it the best engine choice. Thoughtfully equipped, the Sorento is a wise choice among midsize crossovers. Kirk Bell filed this report for NewCarTestDrive after driving the Sorento in Lake Tahoe, California. Head/hip/leg room, f: 39.5/56.7/44.1 in. Head/hip/leg room, m: 39.3/56.4/39.4 in. Head/hip/leg room, r: 36.3/41.4/31.7 in. Cargo volume: 74.0 cu. ft.